In a joint effort, Constantijn Van Oranje (StartupDelta) and Martijn Wijnen (Vice-Chief of Defence) call on startups to contribute their innovative strength for a speedier and smarter reconstruction of the island of Sint Maarten. The ‘Startup Solutions Sint Maarten’ initiative was launched at Impact Startup Fest. The initiative calls on startups to volunteer their thoughts on the reconstruction of Sint Maarten. After a preselection by StartupDelta, useful proposals and ideas will be further elaborated on by the startups and stakeholders involved. 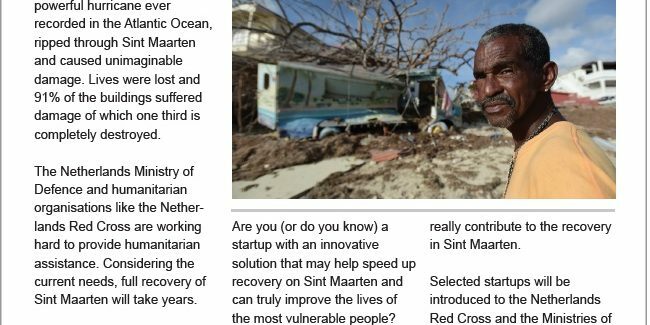 Startup Solutions Sint Maarten is organized in consultation with the Dutch National Coordinator for Reconstruction, the Netherlands Red Cross, and the Dutch Ministry of Defence. Additionally, organizations that are specialized in humanitarian innovation are involved, such as Open House, DCHI (Dutch Coalition for Humanitarian Innovation), and ImpactCity. From 25-28 September, the Netherlands is the epicenter for meetings between international startups, scale-ups, investors, scientists, managers, and other innovators. Participants meet in different locations around the country. StartupFest Europe brings together over 1,000 European startups and connects them to over $100 billion in investment capital, both from private investors and multinationals. This year’s StartupFest Europe’s theme is ‘Global Challenges, Startup Solutions’. Startup Solutions Sint Maarten serves as a test case of how young technical companies can contribute to resolving big global challenges.